Truth by Kbaig: Pakistani Woman Imprisoned in India and her Little Girl! Pakistani Woman Imprisoned in India and her Little Girl! 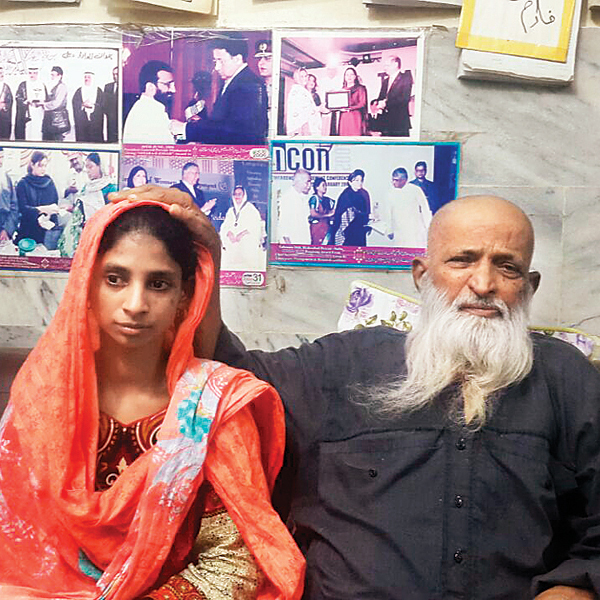 Geeta was only 11 years old when she mistakenly crossed border and arrived into Pakistan. She was deaf and dumb by birth due to which she was unable to tell about her identity and citizenship. She was taken by Pakistani soldiers on border patrol. They tried their best to know about her; however, when they could not succeed they handed her over to an NGO for Missing children. From there she was handed over to the Edhi Homes Karachi. Wife of Abdul Sattar Edhi realized from her activities that she is Hindu; so she cared her as a Hindu. 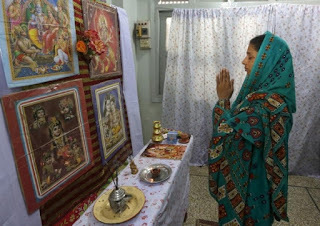 Edhi (late) took her himself to the temple (Mandir) so that she may perform her rituals. On the occasions of celebrations of Hinduism she was given new dresses and other things as Hindus do; however, despite of all this Edhi remained concerned that how he may return Geeta to her parents. In 2011, Edhi contacted Indian High Commissioner in Islamabad. Indian High Commissioner visited Edhi Homes Karachi, met with Geeta, took her pictures and sent to India so that her parents may be traced out. In this situation, Pakistan govt. provided full support to Indian High Commissioner so that the deaf and dumb girl may be returned to her parents. Although after meeting Geeta Indian High Commissioner was sure that Geeta is a Hindu Indian girl but despite of all this Indian Foreign Ministry remained reluctant in taking Geeta back to India. However, on the pressure of Indian media after four years Indian govt. accepted to take her back while she had turned 20 years old. On 26th October 2015, when Mrs. Edhi arrived New Delhi along with Geeta, whole India was celebrating it. 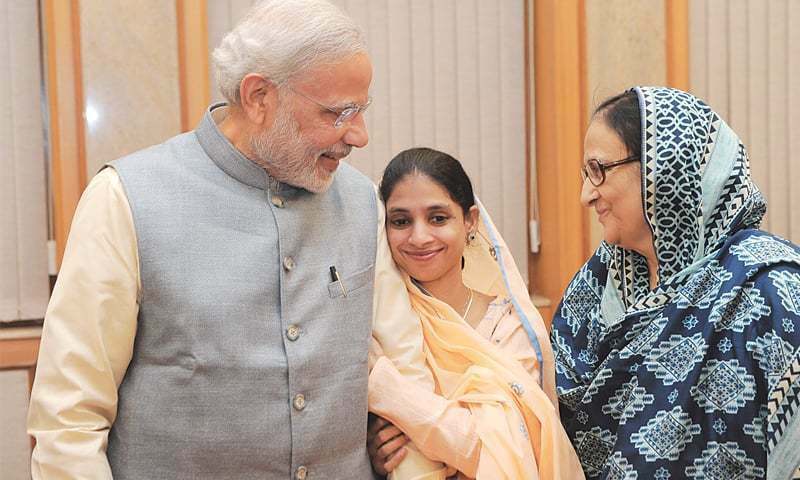 Indian Prime Minister also met with Mrs. Edhi and offered her cheque bearing one hundred million Indian Rupees for Edhi Foundation which was returned by Mrs. Edhi that this happiness is enough for her that Geeta has returned to her homeland. Afterwards, Indian Prime Minister called his counterpart Mr. Nawaz Sharif and thanked for the cooperation. Despite of tensions between both countries, Indian PM was forced to call Pakistani PM because due to the cooperation extended by Pakistan and reluctance of India this issue has been highlighted on international level. Pakistani wanted to resolve this issue as soon as possible on the basis of humanity. On the other hand when any daughter of Pakistan is wrongfully confined in India neither Indian human rights organizations nor Pakistani organization for human and women’s rights raise their voice. Even those NGOs who remain no stone unturned in favor of Indian terrorists sentenced by Pakistani courts they have only one stance that they want to minimize tension between both countries by releasing Indian terrorists; even they are silent now. Due to such like activities of such NGOs few years ago Kashmir Singh, Gopaal Daas and Sarjeet Singh (Indian Intelligence operators and terrorists) were released from Pakistani prisons despite of the fact that they were responsible for murder of hundreds of innocent Pakistanis through terrorist activities. Even Justice from Indian Supreme Court wrote letter for release of Gopaal Daas. But for the Pakistani woman and her innocent baby girl imprisoned in Indian Prison, Indian Supreme Court is dead silent and unable to take any action. Indian Prime Minister had pledged to donate 10 million Indian rupees to Edhi foundation, that Mrs Bilquis Edhi refuse to accept. The news about Pakistani woman Robina imprisoned in Indian Prison at Indian Held Kashmir for last four years along with her baby girl came to the light when a lawyer Shafqat Hussein from Indian Held Kashmir informed media about her. Shafqat Hussein met Robina first time in 2012, when she was being transferred to Kot Bhalwal Prison in IHK. Robina told him that she is Pakistani citizen from Hyderabad who visited New Delhi for treatment of Asthama along with her husband. Suddenly, her husband went missing in New Delhi, her passport and other documents were also in his possession. With help of people she succeeded in reaching Wahga border but as she did not have her passport and other documents so she was arrested by Indian Police. Mir Shafqat Hussein, Lawyer from Indian Held Kashmir presented all the evidence in the court but due to the complexities in the court procedure, after such a long time Indian Held Kashmir High Court ordered release of Robina and her little girl to be released and handed over to Pakistan. When these news came to Pakistan, Chauhdary Nisar, Interior Minister of Pakistan ordered NADRA Pakistan to collect information about Robina so that her nationality as Pakistani may be confirmed and she may be brought back to Pakistan. 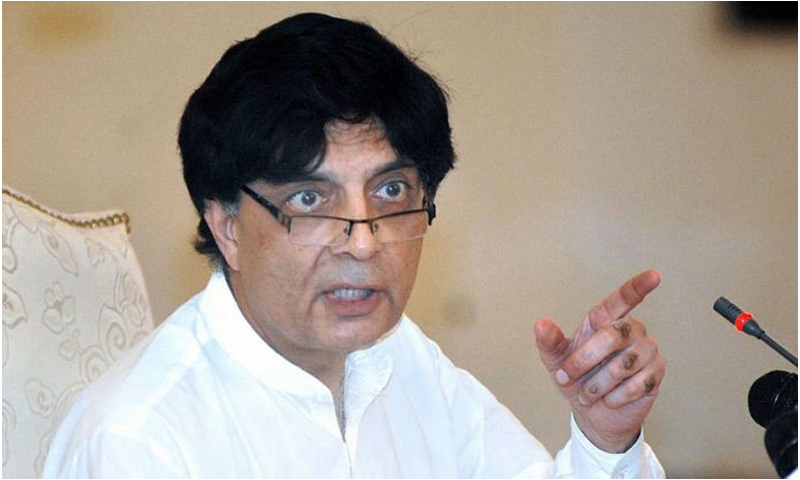 ISLAMABAD Interior Minister Chaudhry Nisar took notice of a Pakistani women and her daughter languishing in Indian jails since 2012. Indian govt. is not providing any support in this regard. According, to the lawyer of Robina, if Indian govt. creates any hurdle in her release than he will have to file the contempt of court. The statement of the lawyer, it seems that India is not ready to release her. Another, important question is that where is the husband of Robina? Has he himself gone missing in New Delhi or taken by Indian Secret Agencies? Such like incidents are nothing strange in India. Before this Imran Yousaf Chipa and his wife Sofia Kanwal were kidnapped to India from Katmandu Capital of Nepal by Indian Secret agencies. There they were imprisoned under the allegations of entering into India for terrorism while they went to Kathmandu for Honey Moon. They were inhumanly tortured and asked that confess in front of media that they are agents of ISI and entered into India to kill Narindra Modi than they will be spared. However, due to the struggle of their relatives and Human Rights Commission in India they were ordered to be released by Indian court due to non availability of evidence against them.